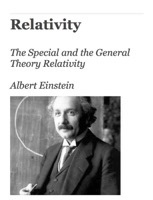 This is the ibook version of the Relativity authored by Albert Einstein in 1916. The electronic version of the book is available under the Project Gutenberg license. This book is meant only for education purpose.